My first time staying in Melbourne. Had a very good time, made lots of friends from the hostel - the crowd here really know how to have fun. Location is good, about 10 minute walk into the city, or a train just down the street. 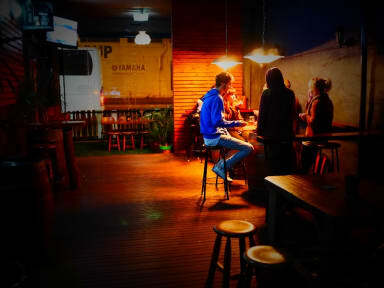 The hostel has a great bar - always happy hour or something happening! 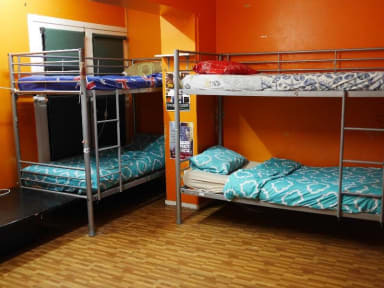 The best Hostel in Melbourne and even in Australia so far!!! Unfortunately it is really dirty and a bit dilapidated. But what made my stay enjoyable though is the really friendly, warm and welcoming staff! staff was nice but all the rooms were dirty (stayed in two). only stayed because it was cheap. Our room was next to the garage/ garbage without windows and very dirty. Lockers were available but we couldn’t lock them. Furthermore we had a bright exit sign in our room which was very annoying at night. Our room smelled disgusting. The bathroom and kitchen area was dirty too. In addition less kitchen equipment available. No dining room. We slept in a room without daylight and right next to the garage! There were two annoying exit signs lighting up all night.Lockers available but we weren't able to lock them because the locks were not working. Kitchen and bathroom were very messy and dirty and there were a even mice in the rooms. Wi-Fi was barely available and as they smoked inside the whole building was smelling. Just chose it because it was cheap but wouldn't come back at all.